1. Whisk buttermilk, mayonnaise, dill, lemon juice, mustard, honey, garlic powder and salt in a medium bowl until combined. 2. 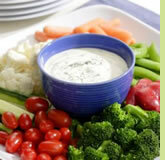 Serve the dip with vegetables of your choice.